Using a foam roller is a great way to get a similar result to a massage without the added price (or even having to leave your house)! They are a great addition to any golf fitness program. So what is a foam roller? Maybe you've seen or heard of them before but had no idea what kind of benefit they can provide. 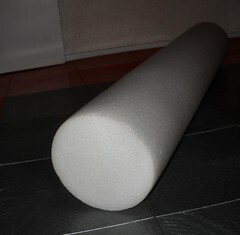 It is essentially a cylindrical shaped foam composite that you lay on and use your own body weight to provide compression to your muscles and soft tissues. Some areas may feel very good while others may be quite sore. You find these muscle "knots" and then roll back and forth over top of them until they feel better. Very similar to a deep tissue massage! Rollers are commonly used in orthopedic physical therapy clinics and athletic training rooms. They also can be purchased for home use. I use them practically every day with my patients and many of them have bought them and are very happy with their purchase. The roller works particularly on the fascia. The fascia is a connective layer of tissue that lies between your skin and the muscles. It surrounds groups of muscles and forms compartments as well (for example, your quadriceps group is in one compartment while your hamstring group is in a different compartment). It is possible to develop adhesions between the skin, fascia, and muscles. Essentially, the tissues become stuck and do not move efficiently. This is important not only for golf but for any activity because you want your soft tissues to move as smoothly as possible. Using a roller will help break up these adhesions! Assuming that you have already been weight training for golf, using a roller both pre and post workout will help combat muscle soreness. However, using a roller should not be a substitute for more traditional flexibility exercises. Actually, a good mixture of flexibility exercises and rolling would be preferred! -Preferably use the roller after you have warmed up or at the end of a workout routine. -Practice makes perfect! You may have to move your body in positions that feel awkward, but over time, they will become much more natural. -Roll slowly along your muscles. If you find a very tender area, hold on that spot until the soreness subsides. -It may not feel that great while you are using it! Many people call using the roller a "good pain". It may feel uncomfortable, but it should feel better once you are done. -Experiment! I listed some very basic positions in which to use the roller. Sometimes things aren't as cut and dry as the standard. Rotate limbs, shift your weight, find different ways to target some of those muscle knots! -One more thing: Most importantly, using a roller isn't for everyone! If you have concerns, please consult your physician. In addition to rollers, also consider: Kettlebell exercises, a BOSU Ball, or an exercise ball!